Dreamland has been the home of luxury beds, bed frames and headboards for more than 40 years and over the decades has earned an enviable reputation in the trade. The knowledgeable team at Dreamland understand the importance of a good night’s sleep, that’s why they’re always keen to help their customers find the right bed for them. A great emphasis is placed upon training at Dreamland and the entire team are able to offer impartial advice to every one of their customers. Many of the staff attend manufacture lead courses, factory visits and trade shows culminating in a deeper understanding of the bed industry. 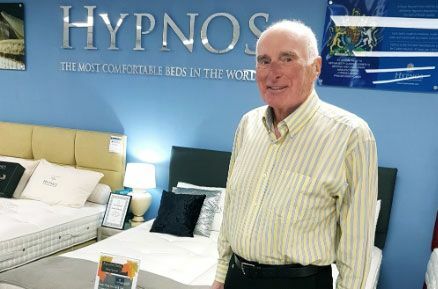 Dreamland is the area’s leading stockist of Hypnos, Somnus and Relyon handmade beds. Whatever their requirements, customers at Dreamland are sure to find the perfect bed for them, that’s why so many generations return to the company again and again. great work in the local community. The hospice was established in 1991 to offer patients with incurable or life-limiting illnesses the opportunity to enjoy their lives to the fullest, however long that life may be. Donations are the only reason Mary Stevens Hospice are able to provide the level of care they do. That’s why the Dreamland team are so keen to do what they can to aid the charity.